According to Yosifu, his trademark penchant for rich, diverse colors was inspired by his hometown of Matailing in Hualien. Dotted with rice paddies and dissected by a river, the Amis community changes hues with the seasons. “I feel very lucky to have been raised in an environment with such breathtaking natural views,” he said. Growing up in Matailing, Yosifu dreamed of becoming not a painter, but a singer. At age 18, he moved to Taipei to pursue that ambition, but despite winning several competitions and releasing an album, he never made it as a pop star. Feeling directionless, Yosifu accepted an invitation from a friend to visit the chilly, calming climes of Edinburgh. He immediately fell in love with the city’s beautiful, historic landscapes. That was more than two decades ago and he has lived there ever since. During his first three years in Scotland, Yosifu worked as a painter and decorator. He only transferred his skills from walls to canvases after a 2003 holiday with friends to Greece. According to Yosifu, while sleeping in an attic in Athens, he dreamed of three angels standing at his bedside. As he stared at the figures, they told him: “It’s time to paint.” “They guided my hand as I drew a colorful river on the wall,” he said, adding that this experience motivated him to pursue a career in art. In 2005, Yosifu got a major break when he was included in an exhibition of 10 emerging artists at Edinburgh Festival Fringe. He was the first one to sell a piece at the show. Buoyed by this positive feedback, Yosifu mustered the courage to approach galleries, luxury hotels and upscale restaurants. The response from those businesses was less encouraging, however, and after numerous rejections he began to lose hope. Then one day he was taking a break at a local cafe when he noticed several paintings on the walls with price tags next to them. Yosifu checked with the cafe owner and learned that there was an opening to display work, but only for five days. He pounced on the opportunity, with the result that 12 of the 15 pieces he exhibited were sold. Over the following years, Yosifu’s works were exhibited at a variety of venues, including Candid Arts in London and Gladstone Gallery in Edinburgh. According to the painter, it was not until he met entrepreneur Stanley Yen, founder and chairman of the Taiwan-based Alliance Cultural Foundation, that he started to spend more time depicting tribal culture and traditions. Yen encouraged him to delve into his indigenous roots, advising that this would bring greater emotion to his work. “That was when I decided to stop going by my English name Jamie and use my Amis name Yosifu,” the artist said. 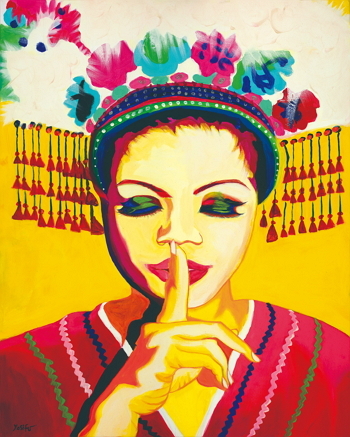 His 2010 piece “Can’t Speak” shows an Amis woman holding a finger to her lips. 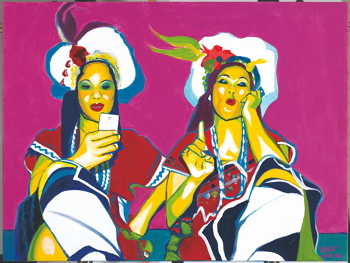 The piece highlights past restrictions on the use of indigenous languages during public events and at school. This focus on indigenous themes boosted the popularity of Yosifu’s works. In 2013, he became the first aboriginal artist to hold a solo exhibition at Taiwan Taoyuan International Airport. 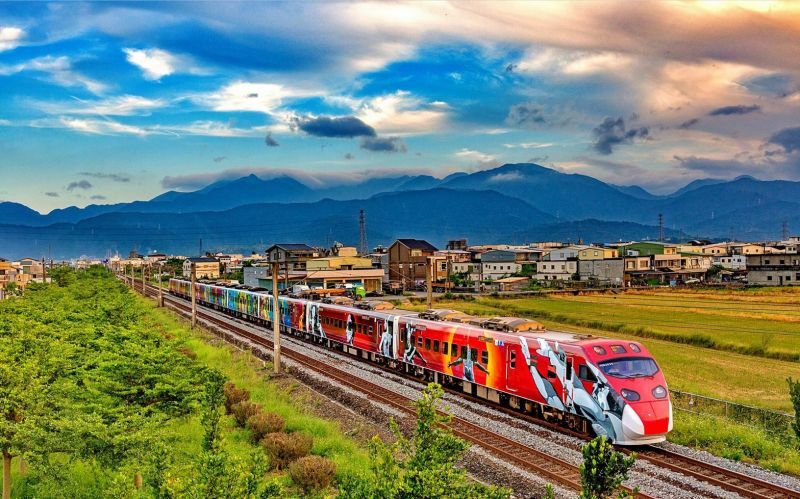 His creations have also adorned trains on the Taoyuan Airport metro and the New York subway system. Yosifu said he treasures his Amis cultural identity and is committed to helping the next generation of indigenous talents embrace artistic expression and find prosperous futures in their villages. To this end, he and his sister opened Tribal Queen Art Cafe in Matailing last December.